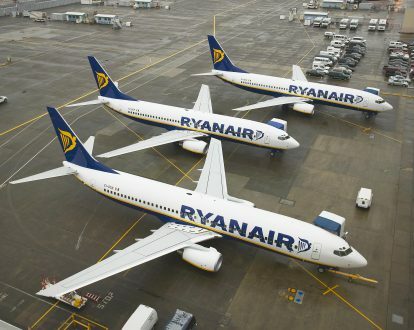 Has one of Ryanair's top executives, with a 30-year career at the airline been forced out of a job as Michael O'Leary hunts for a scapegoat? It would appear so, Michael Hickey, was the airlines' chief operating officer, was in part responsible for scheduling shifts for pilots, along with many operation functions has been 'forced' to resign, following the mass cancellations the airlines has inflicted on its passengers. Many in the industry and media are speculating that Hickey had to go after a falling out with the egotistical megalomaniac O'Leary, who apportions the blame for the chaos squarely at the door of Hickey. This is the first of the senior management team to walk or be pushed from Ryanair since the fiasco began, some expect more before this time next week. However, far from leaving the company forthwith, as one might have expected had relations between Hickey and O'Leary disintegrated to breaking point. No, Mr Hickey is going to stay with Ryanair, at least for the foreseeable future. Yes, he leaves Ryanair at the end of the month, but he stays on in an advisory role indefinitely, one the same salary with the same conditions and benefits. So he's resigned, but he's not going anywhere! Read on to see what O'Leary said about the resignation. Michael O'Leary said "Over the past 30 years Mick Hickey has made an enormous contribution to Ryanair, especially the quality and safety of our engineering and operations functions." "He will be a hard act to replace, which is why we are grateful he has agreed to continue in an advisory role to smooth the transition to a successor and to complete a number of large projects he is currently working on including a multiyear engine maintenance contract and new hangar projects in Seville and Madrid." So, is Hickey's resignation really little more than a charade to keep the shareholders happy and make the airline look, at least on the surface, that it's doing something to change the chronic mismanagement that's already disrupted so many peoples travel arrangements?